Root canal shaping is facilitated. Limits the risks of breakage thanks to the use of Nickel-Titanium. With tapered canal preparation, the inactive tip respects canal anatomy. HERO Shaper can be used in 3 sequences so as to cope with any curve of the root. 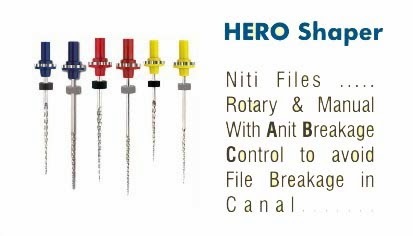 HERO Shaper guarantees simple, quick and efficient canal preparation. Avoids screwing effects: the helical angle of the cutting edges varies from the tip to the shank. The blade shows a triple helix cutting edge. The tip is inactive in order to follow the canal anatomy. Time saving: 10 seconds of use per instrument for efficient shaping. Anti Breakage Control: the instrument “unwinds” to prevent the risk of fracture. Yellow sequence: Difficult canals, severely curved, possibly with significant hyper calcification, making any first penetration tricky with the finest hand files. Red sequence: Canals of average difficulty with moderate curvature and/or more hyper calcification, making first penetration with a n°10 K file hard to achieve. Blue sequence: Easy canal preparation, low curvature, orifice and canal large enough to allow a n°15 K file to reach the Apex.